Sometimes your neighbor’s trash becomes your problem. That is certainly the case for one West Palm Beach resident. After her elderly neighbor died, Jennifer Hillsgrove, the condo owner next door is dealing with left behind trash towering at foot feet high. That’s a lot of trash for a condo! “It makes me sick to my stomach, to be honest,” said Jennifer Hillsgrove, to a local TV news station. “I’m very concerned what’s in that place. I mean it’s disgusting,” she said. To make things worse, since the occupant’s death, the A/C has been turned off leaving those piles of garbage to ferment. It wasn’t long before the cockroaches showed up and made their way into Jennifer’s unit. Jennifer says an elderly man lived in the unit and he passed away about a month ago. Since his death, she says the A/C has been turned off, those piles of garbage are starting to smell, and the filthy place is attracting thousands of cockroaches that have started to come into Jennifer’s condo. When she asked for help, Jennifer didn’t get far. Eventually, city officials were brought in but they couldn’t even enter the condo without a court order. It is a mess on many levels. All of this brings up the issue of rubbish removal from your own home. The main reason that clutter piles up in most homes is that it is a challenge to remove it without help. That help is now available thanks to Junk King Palm Beach. 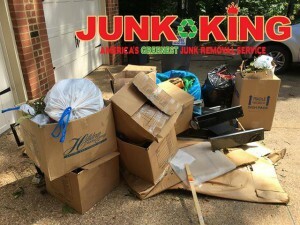 The crews working for Junk King are all licensed and insured. That makes them the exact type of worker you should invite into your home. They’re going to treat your property with a lot of respect. It helps when you have the experience with maneuvering heavy objects down stairs and narrow hallways. You might not be able to move something but the Junk King crew won’t have any problems. Junk King also moves fast. You might be able to call in for an appointment at breakfast time and have all your stuff gone by dinner. You no longer have to let clutter take over your West Palm Beach home thanks to Junk King Palm Beach. This entry was posted in Palm Beach Junk Removal and tagged Junk King, junk removal, West Palm Beach on May 31, 2018 by Junk King. Last updated May 31, 2018 . Was your dad the type of guy who liked to build things? That probably meant that the garage was the workspace and there are a lot of things around your house that you can point to with pride and say, “Dad made that.” It could also mean that over the years, there have been a lot of “leftovers” accumulated inside and outside of the garage. If your dad has a junk pile on his property, then this Father’s Day you can finally help him get rid of it. All it would take is one call to Junk King Palm Beach. No matter what type of build project this is, there are always scrap pieces of lumber or metal. The first instinct is to hold onto those scraps because you never know where you might be able to use them again. As years go on, those scraps become less useful. That is especially true if they’re being kept outside. Even if they’re stored in a shed or under a deck, there is still a chance they’ll be useless after years have gone by. 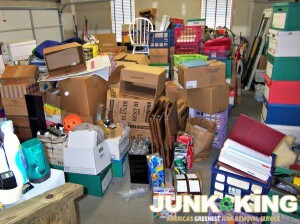 All of those useless items can be hauled away in a single session by Junk King. Best of all, your dad won’t have to lift a finger. As long as you’re having the Junk King crew and their truck come over to your dad’s place for a cleanup, you might as well put them through their paces. This is the chance to get any unwanted furniture, appliance or other rubbish carted away for good. Not only will Junk King be freeing up more space but they’ll also be making things safer. The more clutter there is in a home, the more hazards it creates. Your dad will also appreciate how Junk King gets rid of what they collect. Since they started collecting junk back in 2005, Junk King have been strong supporters of the environment. That is vital in a beach community like Palm Beach. Instead of dumping their truckloads at a landfill, Junk King takes the extra time to sort through everything and pull out those items that could be recycled or donated. That is helping keeping the air and water around Palm Beach clean. This Father’s Day, hire Junk King Palm Beach to help make your dad’s place safer and cleaner. That’s a win/win. This entry was posted in Palm Beach Junk Removal and tagged Father's Day, Junk King, junk removal on May 25, 2018 by Junk King. Last updated May 25, 2018 .